If you would like to make one perfect cup of fresh coffee, combine your own spice mixtures or create your own ground seeds or nuts. Then you can try [XXXX] Electric Grinder and you will not be disappointed. Freshly grind your coffee beans and spices without losing any flavor. Instead of buying pre-ground coffee, try brewing your coffee with freshly ground beans. It will provide a rich aroma and full-bodied flavor for better-tasting coffee. In addition to coffee beans, the versatile grinder can be used for chopping or grinding nuts, seeds, herbs, and spices. Grind for a few seconds, or more, depending on your desired consistency - According to the grinding time, you can easily adjust the coarseness of your spices . Sharp, stainless-steel blades for fast-even grinding. Powerful Motor, Convenient Dust Cap, and See-through Container. Stainless-steel blades will not spin until the lid is securely covered on; to us your safety is our first concern. With its compact and sleek looking, the electric grinder makes a convenient and useful addition to any kitchen. We believe this grinder can help you solve a lot of troubles in daily life. 1.The machine only supports grinding dry food. 2.Cleaning instructions: After cleaning with the included cleaning brush, wipe with a wet towel, can not be washed by water. Easy to clean. 【SAFETY】Using food-grade 304 stainless steel makes the grinder safe and durable ,which will not alter the flavor of the spices. Strong protection design - lid activated switch, which is easier and safer. No noise and more comfortable. 【CONVENIENCE & SLICK DESIGN】Sleek and stylish body, one-button single-handed operation. 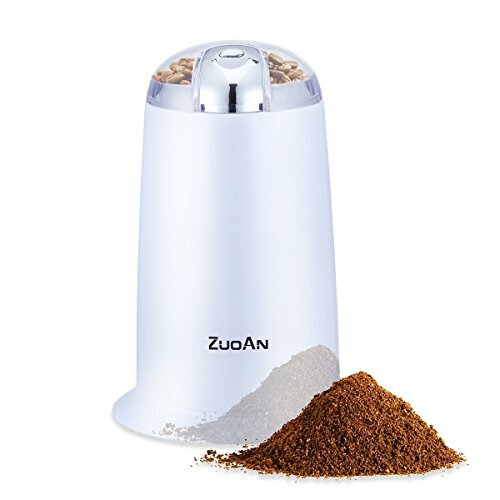 With transparent container, you can look at the operation of grinding fresh spices. Small size, convenient storage. 【Quick Grinding】High Quality Double Stainless Steel Blades and a strong motor 20000 rev/min to ensure even and Quick Grinding. Electric grinding machine allows you to liberate your hands.Over 10,000 times grinding. 【MULTI SPICE GRINDER】Grind coffee beans,nuts,herbs,grains,spices, sugar,linseed, pumpkin seeds ect. According to the grinding time, you can easily adjust the coarseness of your spices. 【SAFETY ENSURE】 This coffee grinder automatically stops working when the machine is overheating, make sure your safety at home. Manufacturer: Zhongshan left bank Electric Appliance Technology Co., Ltd. Publisher: Zhongshan left bank Electric Appliance Technology Co., Ltd. Studio: Zhongshan left bank Electric Appliance Technology Co., Ltd. If you have any questions about this product by ZUOAN, contact us by completing and submitting the form below. If you are looking for a specif part number, please include it with your message.